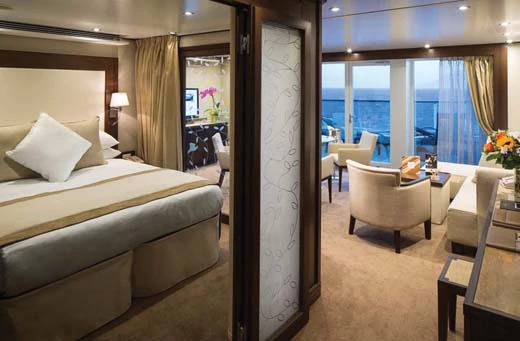 Seabourn Odyssey is the first in a new class of ships for Seabourn, accommodating just 450 guests in 225 luxury suites. 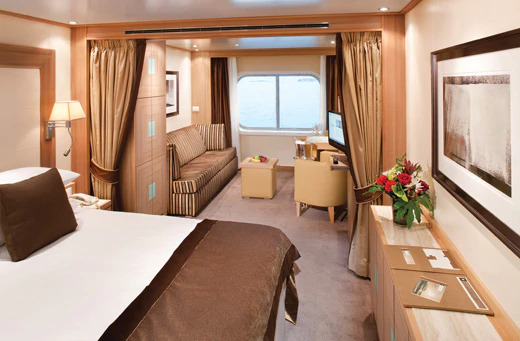 With the highest space-per-guest ratio in the industry, this luxury liner guarantees a relaxing and enjoyable cruise that will never feel overcrowded. 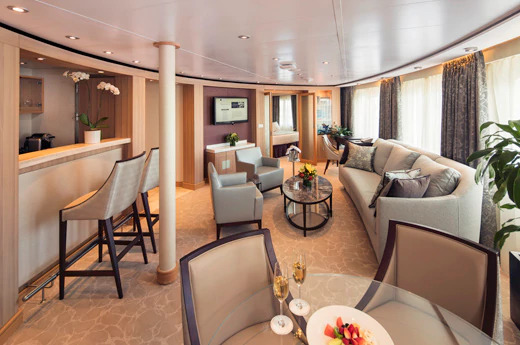 Seabourn Odyssey excels at creating a comfortable and relaxing environment across her 11 elegant decks. 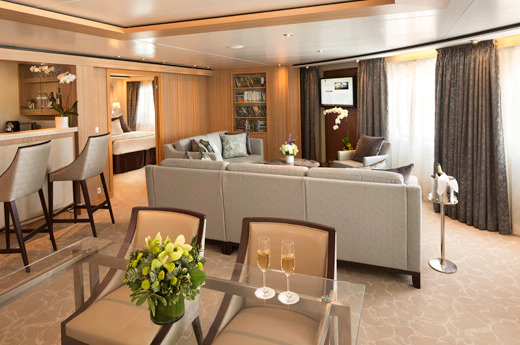 Light woods, subtle colours and rich soft furnishings lend themselves to the contemporary and calming atmosphere on board the ship. Three dining venues and a pool-side grill ensure you are never far from delicious, fresh cuisine and the pleasing social spaces retain a special club-like feel. 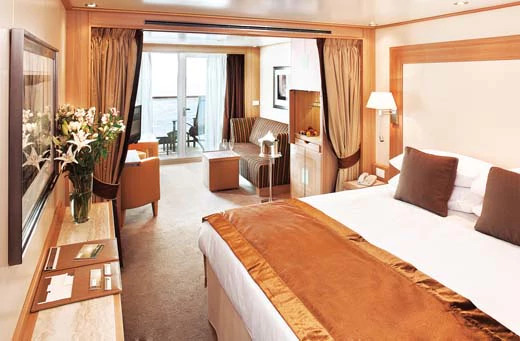 For those looking to unwind, Seabourn Odyssey, features six outdoor whirlpools and one of the largest spas on a cruise ship, whilst two glorious swimming pools and organised water sports ensure there are plenty of opportunities for those who enjoy keeping active. 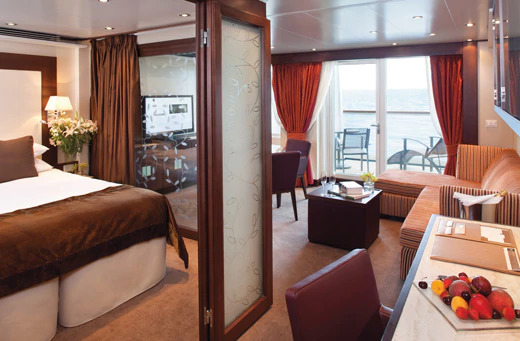 Seabourn Odyssey offers fantastic choice in accommodations, all beautifully presented and tastefully decorated in soft neutral tones. Choose from 225 ocean view suites, 90% of which have their own private verandas. With 7 types of suite in the range, each with a walk-in closet with safe and equipped with an interactive, flat-screen TV and a fantastic variety of music and movies. Wintergarden Suites offer the greatest luxury, featuring large windows with ocean views, dining for six, and a lavish bathroom with whirlpool bathtub. 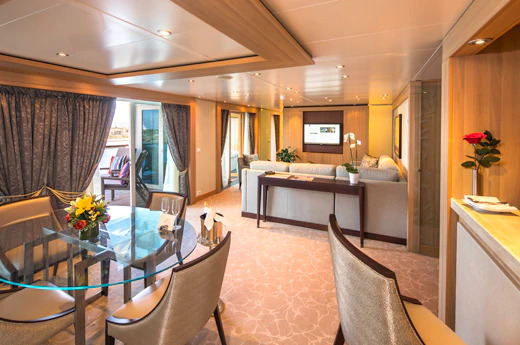 Signature Suites and Owner's Suites offer a light and spacious living space with expansive ocean views, while Verandah Suites and Ocean View Suites have a warm and homely feel that will become your own oasis of calm at sea. Enjoy fresh, vibrant ingredients expertly combined and presented in The Restaurant, the ship’s main dining venue. Wherever you are in the world, the chefs take pride in delivering local delicacies from the area, using locally sourced produce. For a memorable experience, savour sensational seven-course tasting menus at the ship’s alternate dining venue, Restaurant 2. This exciting setting seats up to 50 guests for creative and adventurous dishes, including tapas-sized portions of seared tuna with watermelon, spiced halibut with foie gras and pineapple and hanger steak with poached tomatoes. The Colonnade is the ship's superb casual restaurant, offering both buffet and waiter-service options. With excellent offerings for breakfast and lunch, the alfresco tables are some of the most favoured places to dine on the ship. In the evening, the Colonnade is transformed into a bistro-style restaurant with popular theme nights including, French, Italian and Mediterranean. The pool-side Patio Grill offers more casual options, such as pizza, burgers and chips, with plenty of outdoor seating. Superb room service is available 24 hours a day to enjoy in the privacy of your suite. The excellent Grand Salon is the main entertainment venue, where guests will find interesting lectures, cooking demonstrations, and movie screenings during the day, and live music, dancing, cabaret performances, comedy, and classical recitals, at night. Located below the Grand Salon, The Club is a lively, modern nightclub where the large dancefloor and comprehensive bar guarantee a party atmosphere every night. Soak up the atmosphere in The Casino and try your hand at blackjack, roulette, poker or one of the many slot machines. When the captain anchors and deploys the water sports Marina, guests can take to the warm sea to enjoy boardsailing, water-skiing, kayaking, banana boat rides and pedal boating right from the ship. Guests can also swim safely in a separate enclosed area. Seabourn Square on deck 7, is the relaxed social hub of the ship, providing a welcoming and comfortable meeting place with cosy sofas, comfortable chairs and cocktail tables. Catch up with new found friends over coffee and pastries, or browse the library of books lining the walls. 8 online computers are available for guests to use, and if you require anything else, versatile Guest Services Specialists sit discreetly at individual desks, happy to share tips and advice, and assist with booking tickets for shore excursions, or anything else you may need. The largest spa facility on any luxury cruise ship is designed for optimum relaxation, with six treatment rooms, a thermal area featuring a large hydro-pool, dry float, sauna and steam rooms, and full-service salon. The well-equipped gym and a motion studio feature a Kinesis Wall and Thai massage area. Get involved with the many group classes, including Kinesis training, Yoga and Tai Chi at no extra fee.